December ~ Harvests, Maintenance, Planning & Getting Seeds! Well, there are several important events in December, LOL. First is being sure everyone who knows you knows what is on your holiday garden wish list! Plan your spring garden, get catalogs, and order seeds NOW! Maintain your garden, keep up with SoCal winter harvesting, enjoy your bounty, try some new recipes! If you wish, plant your last round of winter plants – know that if they come in late they may interfere with earliest spring planting space. Place them carefully so tall early spring plants can be installed on time. Or leave those spots open. Harvest Brassicas of all sorts! The big ones, broccoli, cauliflower and if you live in a good chill area, Brussels sprouts, have grown big enough now and your earliest varieties are producing handsomely. Harvest your brocs and caulies while the heads are still tight. If you miss that, harvest asap, even the flowers and flower stalks are edible! After you take the main broccoli head, let your plant continue to grow so it will produce smaller side shoots. Some varieties produce large 3 to 4″ mini brocs and later, smaller salad size ones right on through summer! Cauliflowers are a one time harvest though you can keep eating the greens. To replace them, you might choose to pop in some beautiful chard, a potato patch, or quick growing mini cabbages in the large open spots that become available. 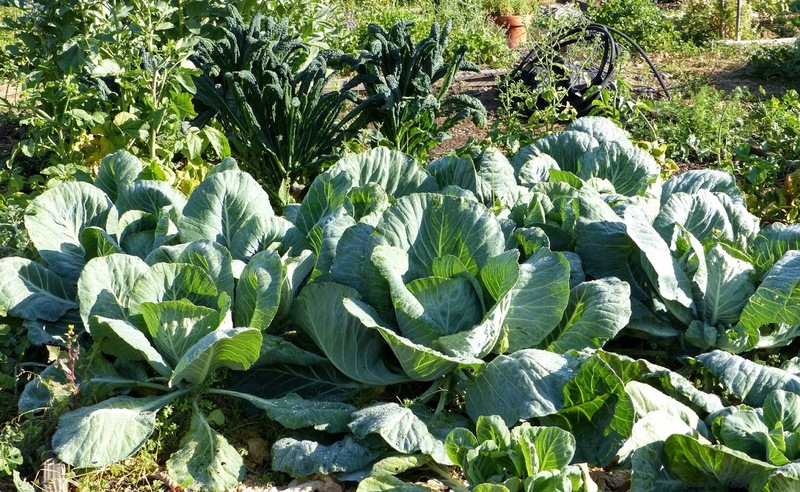 Some cabbages, especially the mini and early varieties, are now headed tightly and ready to eat – slaw, steamed, dropped into soups and cold weather stews. You can still replant them with mini cabbies if you love them! Winter brings a lot of tasty Root crops. Winter Cylindra Beets are colorful, and have cut and come again leaves too! Long winter radishes like Daikons are spicy! Carrots are splendid to eat at the garden, share with your pup, bunnies, shred into salads, add to winter soups and stews, slice/chop/stick and freeze for later! Grow some Parsnips too! Turnips have so unique a flavor you might want to eat them separately to just enjoy that flavor. Sidedressing is like snacking. Some of your heavy leaf producers and big bodied Brassicas, may need a feeding now and again or just when they start to fruit. If they slow down, or just don’t look perky, slip them a liquid feed out to their dripline, or cultivate in a wee bit of blood meal. Get your long spouted watering can nozzle under those low cabbage leaves. Lettuces love manures. Compost and manure teas, fish emulsion (when there are no digging predators), powdered box ferts, are all good. Winter feeds need to be easy for your plant to take up. Use ½ the strength of your summer feedings. Slow release is a wise consideration. An excellent way to get feeds to the roots is to push in a spade fork no more than 6″ deep. Push it in vertically (so as not to break the main tap roots), wiggle it back and forth just a bit, remove the fork, pour your foods into the holes, close ’em back up. Soil organisms will get right to work, your plant will stay healthy and be quite productive! Worm castings, though not food, work wonders with immunity, soil conditioning and help germination! Mix some in with your liquid feeds you pour around your plant. A mini task is to keep covering the shoulders of carrots, beets, radishes, parsnips and turnips. They substantially push right up above ground as they grow. Planting their seeds deeper doesn’t compensate. It’s the nature of the veggie! Never hurts to put a handy little pile of extra soil near where you plant them, or plant them in a low sloped trench. When they need covering, pull the sides of the trench down to cover them. Uncovered shoulders look dry, are tough, sometimes bitter, and need peeling before cooking. Uncovered carrot shoulders don’t ripen but stay green, just like exposed parts of potatoes turn green. The green on potatoes is slightly poisonous, not enough to do harm, but it doesn’t look good. Watering is important even in cool weather. Also, some plants simply like being moist ie chard, lettuce and short rooted peas, beets. No swimming, just moist. Finger check your soil after rains to see if your soil is moist at least 2″ deep. Sometimes it is moistened only 1/4″ deep, needs more water! Also, be careful of too much water, that makes for an aphid tasty soft plant. Watch WEATHER reports in case of freezes, heavy winds, rain. Before weather, stake and tie plants that need support. After strong winds check everybody right away to see if any plants need help. See more about rainy days! BEFORE you put in seeds, sprinkle a bit of Sluggo type stuff around at least two times (to kill the generations) to keep snails and slugs from vanishing upcoming seedlings overnight, making you think they never came up! No, they didn’t let you down. Killing off the creatures ahead of time saves the babies. It stops new transplants from being seriously damaged or entirely eaten while they are small. Do this a few times, to knock off the generations, and there will be no tiny vegetarian predators for a while. Don’t lose your crops to birds! There is less food for them in winter, and, often, little rain, so they resort to eating tender juicy veggie leaves. 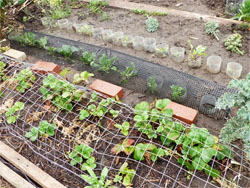 Buy pre made covers, or get clever and cover seeded rows with DIY small openings wire tunnels or a patch cover bent that has sides bent to the ground to keep birds from pecking at little leaves or from plucking tiny seedlings right out of the ground! You can also use small plastic bottle sections to make mini sleeves that birds won’t go down into. 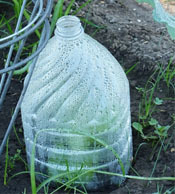 Or for baby lettuces, make large plastic bottle self watering cloches though wire covers let more light in and water through! Bird netting is inexpensive, tears easily, but is good to stretch over peas on a trellis. Prevention and removal! Keep an eye out for pests and diseases and take quick action! A typical disease is Powdery mildew. Plant leaving plenty of space for air circulation, water early in the day so they dry before evening. For mildew apply your baking soda mix. The best combo is 1 regular Aspirin, a 1/4 cup nonfat powdered milk, heaping tablespoon of baking soda, a teaspoon liquid dish soap per gallon/watering can. Before sunrise drench under and upper sides of the foliage of young plants to get them off to a great start! It takes only an hour for the mix to be absorbed! Do this the same or next day if transplanting. Reapply every 10 days or so, and after significant rains. Prevention is so much better than after mildew has set in. See Aspirin Solution. Hose away aphids and whiteflies, mildew. Remove yellowing Brassica leaves. Yellow attracts whiteflies. In general, plant further apart for air circulation, water and feed just a little less to let those leaves harden up a bit. Soft fat leaves are an invitation to aphids and mildew! Chard and beets get Leafminers. Where they have eaten looks terrible but the good part of the leaves is perfectly safe to eat. Plant chard so mature leaves don’t touch, or best of all, in different places around your garden, not in rows or clusters. Thin your plants so they have room. Harvest leaves that might touch first. Remove infested leaves immediately to reduce spread! Beets are not a permanent crop, so they are planted closely. Simply harvest them at their leaves’ prime – ahead of the Leafminers. Per square foot, fast growing cut-and-come-again Lettuce, Chard and Kale are by far the top winter producers! Plant more big plants like brocs and cauliflower, but remember, with cooler weather, they will grow more slowly. That may interfere with early spring plantings in March because you will need time to let added compost, manures, worm castings and Sphagnum peat moss (increases water holding capacity) become part of the soil organism community. If you do plant them, better to get transplants if you can, and shave six weeks off their needed growing time to maturity. Select faster maturing varieties now. As lettuces tire, and other plants like carrots and beets are removed, add more of them and any ‘littles’ you love on the sunny side and between the big plants. If they need more sun, remove large lower leaves of the big plants. Mild tasting littles include bok choy, kohlrabi, garden purslane, arugula, mizuna, watercress, young parsnips and turnips, Daikon winter radishes, and Napa cabbage. For a little more spice, go for those dark green kales, mustard, rutabaga and turnip greens! Try some culinary dandelions for super nutrition! These are plants that will take you through February, March and leave enough time to add compost and to let sit until major spring planting begins in April. Believe me, you are going to get spring planting fever along about March, so plan ahead for it!!! Start seeds indoors the first three weeks of January for early March plantings! Choose varieties that are cold tolerant and are early maturers for the soonest table eats! Seeds for Spring & Summer planting! Perfect time to sit with seed catalogs, do online research. Get your summer garden layout in mind. First choose what is good for your excellent health! Next might be how much harvest you get per square foot your plant takes up if you have limited space and want to feed several people. Since we are in drought conditions, water could be a strong consideration ~ choose heat and drought tolerant varieties. Get some early varieties, for earliest harvests along with later maturing varieties for a continuous table supply. Earlier variety fruits are generally smaller, but Yum! Cherry tomatoes come in first. Place your order for the entire year, while seeds are still available. The Santa Barbara Seed Swap is Jan 27, very soon! Get your seeds ready to share, and prepare your ‘shopping’ list! Remember, a Seed Swap is a random affair. Get your standby favorites from those reliable catalogs. Use Seed Swaps as fun backup source and for local seeds. See Choosing Seeds: Catalogs to Seed Swaps! See also Smart Design for Your Spring & Summer Garden, Seed Selection! Definitely start building compost for spring planting. You could plant green manure where you will grow heavy summer feeders like tomatoes, potatoes, eggplants, peppers, chilis, squash, pumpkins, cucumbers, melons, and corn; hungry stalk vegetables like celery, fennel, rhubarb, and artichokes; or continually producing green, leafy vegetables like lettuce, spinach, Swiss chard, strawberries. Or plant it if you want a break! Just lay in some green manure seed mix – vetch, bell beans, Austrian peas and oats. In Santa Barbara area get the mix and inoculant at Island Seed & Feed. Let it grow two to three months to bloom stage. Chop down, chop up and let it lie on the surface about 2 weeks, keeping it moist. Add any amendments you want – additional manure, compost, and turn under. Let it sit two weeks to two months. Your choice. Let the herds of soil organisms do their work! I usually do about 3 weeks. OR, lay on as many layers of compost material as you can get for an up to 18″ deep area where you will be planting. Put in some surface feeding red wiggler worms. The BEST soil enhancer and you will have a raised bed! Santa Barbara’s 11th Annual Seed Swap is Sunday January 27! The last Saturday of January every year is National Seed Swap Day! Look in your area for an event, and if you don’t find one, collaborate with your local garden clubs or permaculture group to get one going! All about Beets, So Sweet! Virtuous Veggies! Alkalize Your Body for Top Health! Wonderful Gardener-Style Holiday Gifts!Upcoming Gardener Events! Not to miss the January Santa Barbara Seed Swap! International Permaculture Conference, IPC 2020 Argentina! November ~ More Brassicas, Peas, Chard, Lettuces! Happy ThanksGiving! 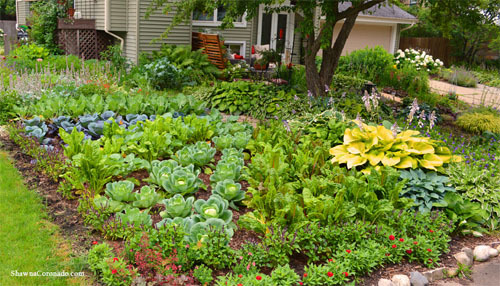 Garden author Shawna Coronado has a fine front yard spread jam packed with winter tasties! Her most popular book is ‘Living a Wellness Lifestyle!’ Her website says ‘Making a Difference Every Day.’ YES! SoCal September planted lettuces are being eaten, plant more! Peas are being eaten, plant more. Kale leaves are or soon will be ready to start harvesting. Broccoli and Cauliflower soon to be tasty! Cabbages will take a bit longer as they pack those leaves on tightly. You can harvest them when they are small, or if you want more food, let them get bigger, but not so big they get looking a bit dry, lose that look of bursting vibrance! Plant more rounds of everything in space you have reserved, or as plants finish. At this cooler time when plants are growing slower, it’s time to plant from transplants. Seeds are fine, and seeds of the same plants, if planted at the same time as the transplants, give an automatic equivalent of a second round of planting! Just remember, as weather cools, they won’t grow as fast as ones planted earlier. Space your plants well. Think of the footprint of your mature plant. Crowded plants can shade each other out, and winter already has shorter days. They don’t get their full productive size or produce as productively. Smaller plants too close together can get rootbound, suffer from lack of nutrition. The remedy is simple! Thin when young and eat these luscious little plants! Or thin when they are bigger – take the whole plant! Rather than planting so closely, keep some of those seeds back for another later planting, or deliberately over plant for tender additions to your salad! If they come crowded in a nursery six pack, gently separate the little plants, plant separately. If you are really brave, do it the John Kohler way! Video Give away your extras! Plant to allow airflow so your plants will harden up a bit. Don’t over feed or water, inviting sucking pests like aphids and whiteflies that easily feed on that soft tissue. Especially true for beets and chard that get leaf miners. Ideally with chard, often a ‘permanent’ plant, space them so the mature leaves won’t touch another chard. 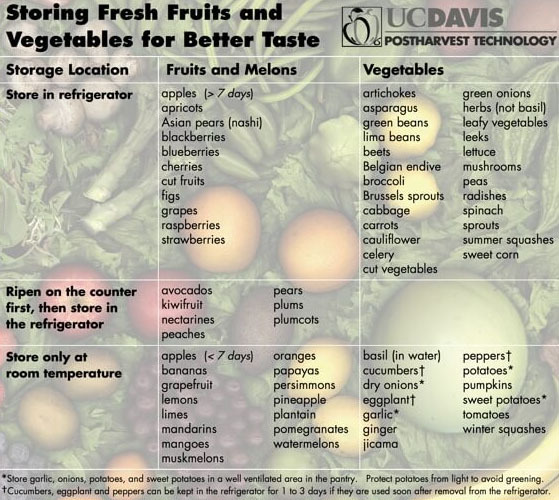 Plants that have generous space produce more! If you like Broccoli a lot, try these varieties! Arcadia is somewhat heat tolerant with excellent side shoot production. All Season F1 Hybrid is low growing, doesn’t shade out other plants, and makes the largest side shoots I’ve ever seen! Cruiser 58 days to harvest, is tolerant of dry conditions. If you can’t wait, DeCicco is only 48 to 65 days to maturity. It is an Italian heirloom, bountiful side shoots. Produces a good fall crop, but considered to be a spring variety. Since it is early, the main heads are smaller. Nutribud, per Island Seed & Feed, is the most nutritious per studies, having significant amounts of glutamine, one of the energy sources for our brains! Purple broccoli, in addition to this, contains anthocyanins which give it its color. These have antioxidant effects, which are thought to lower the risk of some cancers and maintain a healthy urinary tract as well. Research shows the more broccoli varieties you plant, mixing them up, alternating the varieties in the row, not planting in rows at all, the less aphids you will have! Biodiversity means to mix up your plantings to stop diseases and pests from spreading down a row or throughout a patch. Monoculture can be costly in time spent and crop losses. Plant different varieties of the same plant with different maturity dates. Pests and diseases are only attracted at certain stages of your plants’ growth and their own life cycle stages. Another tip is keep your Brassicas cleaned of yellowing leaves that attract White flies. Cilantro repels aphids on Brassicas – broccoli, kale, cauliflower, Brussels sprouts! Said to make them grow REALLY well, bigger, fuller, greener! Plant generous mini patches here and there. Harvest some, let others flower for bees and beneficial insects. Then share some seeds with the birds, collect some seeds for next plantings. Heading winter lettuces like plenty of water to stay sweet, grow quickly, stay in high production. Put them in a low spot or near the spigot, on the sunny side of taller celery. Also, lettuces repel cabbage moths. Put a few of them between the cabbages. Lettuces you want under Brassicas, plant from transplants because dying parts of Brassicas put out a poison that prevents some seeds, like tiny lettuce seeds, from growing. See Super Fall Veggies Varieties, Smart Companion Plantings! Brocs LOVE recently manured ground. Well-drained, sandy loam soils rich in organic matter are ideal. Feed up your soil out to where you anticipate your plant’s drip line will be. The trick to producing excellent broccoli heads is to keep the broccoli plants growing at a strong steady pace. Top-dress the plants with compost or manure tea; or side-dress with blood-meal or fish emulsion; and water deeply. Repeat this process every 3-4 weeks until just before harvest! John Evans, of Palmer, Alaska, holds the world’s record for his 1993 35 lb (no typo) broc! He uses organic methods, including mycorrhizal fungi! And, yes, moose eat broccoli! The Pilgrim Terrace April 2016 Cunningham Family monster Cabbages make the good sized Lacinato Kale behind them look small! If you reserved space for planting mid-January bareroot strawberry beds, plant it to 2 month crops, like lettuce that matures quickly, arugula, mustard, turnips, and crispy red radishes that are ready to pick in little more than a month. Arugula, spinach, pretty Asian greens, such as tatsoi or mizuna, grow so fast you will have baby plants to add to stir-fries and soups just three weeks after sowing. For a quick payback on your table, select the earliest maturing varieties available. Chard grows quickly, but it is a cut and come again plant, so give it a permanent location. Or, pop in a green manure mix to restore your soil. Island Seed & Feed has the wonderful Harmony Four green manure seed mix and the inoculant that goes with it. Nov is late to plant this mix; plant as early in the month as possible. Cut down, chop, turn in sooner for mid-January bareroot planting! Seascape strawberry variety is my #1 pick! It was bred locally at UCSB, is an everbearer, harvest June to October! It makes huge berries that have tasty flavor and keep well. It has long roots so seeks water deeper down, more heat and drought tolerant. It is Strawberry Spot resistant. Terra Sol (Goleta CA) carries them bareroot mid-January. Call and call until they arrive, then go immediately to get them cz they are quickly gone! Celery is lovely, fragrant, low-cal! Like lettuce, it is a cut and come again. Feed it from time to time, it’s working hard. Plant it by the water spigot. If you have room, you can let celery, cilantro and carrots, flower and seed too! Peas on a trellis, in a cage, take up less space, are off-the-ground clean and easier to harvest. Make a note to plant carrots on the sunny side of peas to enhance the growth of your peas! Baby Little Fingers make small carrots quicker than most, only 57 days to maturity! Put some beets behind the peas. They will get light through the frilly carrot leaves and the peas will go up. Peas and beets don’t mind a fair bit of water, but carrots will split if overwatered. Plant the peas a little lower and the carrots a little further away and water them a tad less once they are up. The onion family stunts peas, so no onions, bunch onions, leeks, garlic, shallots, chives nearby. See Best Varieties of PEAS and Why! 1st half of Nov: Plant seeds of globe onions for slicing. Grano, Granex, Crystal Wax. GARLIC! Hmm…usually I would encourage you to grow garlic but with these general overall warmer times, some garlic lovers are reporting they aren’t growing it here anymore. Garlic likes chill, so even in our regular winters we don’t get the big cloves like up in Gilroy, the Garlic Capital, Ca. If you don’t mind smaller bulbs, plant away. Plant rounds of your fattest garlic cloves now through Dec 21, Winter Solstice, for June/July harvests! See a LOT about GARLIC! Divide your artichokes! Give new babies plenty of room to grow big and make pups of their own or give them to friends! Remember, they have a huge 6′ footprint when they thrive and are at full maturity. Plant bareroot artichoke now or in Feb, or in March from pony packs. They have a 10 year life expectancy! Shade If you want a lower profile or space is limited, get dwarf varieties. That allows more flexibility when you choose how to place your plants or are filling in a spot where a plant has finished. Plant your Tall plants in zig zag ‘rows’ so you can plant them closer together. In the inside of a zig zag, on the sunny side in front of the ‘back’ plant, put in your fillers – medium height plants and shorties. A mix of Bok Choy, mustards, longer winter radishes – Daikon, kohlrabi, parsnips, rutabagas and turnips would be exciting and give winter variety to your table! With the majority of fall crops, the main harvest is leaves! Cut and come again means a long harvest…and a very hungry plant! So, plant in super soil to get a good start! Add composts, manures, worm castings. In the planting hole, mix in a handful of nonfat powdered milk in for immediate uptake as a natural germicide and to boost their immune system. For bloomers, brocs and caulis, throw in a handful of bone meal for later uptake at bloom time. If you have other treats you like to favor your plants with, give them some of that too! Go very lightly on incorporating coffee grounds either in your compost or soil. Studies found coffee grounds work well at only 0.5 percent of the compost mix. Yes, that’s only 1/2 a percent! See more details about soil building! The exception is carrots! Too much good soil makes them hairy, fork, and too much water makes them split. Also at transplant time, sprinkle mycorrhizal fungi directly on transplant roots, except Brassicas! Pat it on gently so it stays there. Direct contact is needed. Brassicas don’t mingle with the fungi and peas may have low need for it, so no need to use it on them. Winter plants need additional feeding, and steady adequate moisture to stay healthy and able in such demanding constant production. Give them yummy compost to keep their soil fluffy with oxygen, the water holding capacity up to par. Be careful not to damage main roots. Get a spade fork if you don’t have one. Make holes in your soil instead, then, if you don’t have skunks or other digging predators, pour in a fish/kelp emulsion cocktail! Or compost, manure, or worm cast tea down the holes. Your plants will thrive, soil organisms will party down! Winter Water! An inch a week is the general rule, but certain areas and plants may require more or less water. Don’t let light rains fool you. Do the old finger test to see if the top 2” of soil are moist. If you are managing a landscape or larger veggie garden, slow, spread and sink incoming water. Install berms or do some terracing. Direct special channels to water your precious fruit trees. Use gray water as much as possible. Carrying buckets of water builds character, but a gray water system is ace! See Santa Barbara Rebates for both residential and commercial assistance. Mulch? The purpose for mulch in summer is to keep your soil cool and moist. If you live where it snows, deep mulch may keep your soil from freezing so soon. But when SoCal temps start to cool, days are shorter, it’s time to remove mulch, especially if it is a moist pest or disease habitat, and let what Sun there is heat up the soil as it can. When it is rainy, mulch slopes with mulch that won’t blow or float away. If needed, cover it –garden staple down some scrap pieces of hardware cloth, cut-to-fit wire fencing or that green plastic poultry fencing. Or do a little quick sandbag terracing. The mulch exception is low to the ground leaf crops like lettuce, arugula, spinach, bok choy and chard. 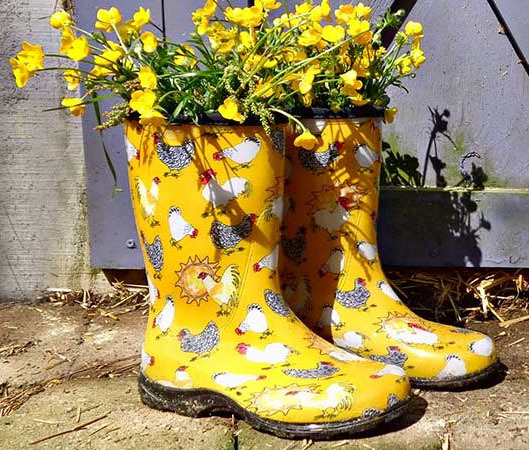 They need protection from mud splash. Lay down some straw before predicted storms. If you live in a windy area, lay something over the straw, like maybe rebar pieces, to hold the straw in place, some remesh, or some anchored chicken wire. Pest & Disease Prevention Drench young plants, seedlings getting their 3rd and 4th leaves, and ones you just transplanted, with Aspirin solution to get them off to a great start! One regular Aspirin mushed, 1/4 C nonfat powdered milk, 1/2 teaspoon liquid dish soap (surfactant), per gallon of water. Aspirin triggers a defense response and stimulates growth! Powdered milk is a natural germicide and boosts their immune system. Reapply every 10 days or so, and after significant rains. RESTORE OR REST an area. Decide where you will plant your tomatoes, heavy feeders, next summer and plant your Green Manure there! Plant some bell beans (a short variety of fava easier to chop down) or a vetch mix for green manures to boost soil Nitrogen. The legume mix can include vetch, Austrian peas and bell beans, plus oats that have deep roots to break up the soil. When the bell beans start flowering, chop the mix down into small pieces. Let that sit on the surface, keeping it moist, for two weeks, then turn it under. Being moist aids decomposition. If your soil can use other amendments, manures, green sand, compost with bark bits for water holding capacity, add them and turn everything under at the same time! Wait 2 or more weeks, plant! Bell beans alone are great; you get a lot of green manure per square foot. If you change your mind, eat the beans! Or cover an area you won’t be planting with a good 6″ to 18″ deep of mulch/straw and simply let the herds of soil organisms do their work over winter. This is called Lasagna gardening, sheet composting or composting in place – no turning or having to move it when it’s finished. If you are vermicomposting, have worms, add a few handfuls to speed up and enrich the process. Keep it slightly moist. Next spring you will have rich nutritious soil for no work at all! Birds and Bees! Plant wildflowers now from seed for early spring flowers! Germination in cooler weather takes longer, so don’t let the bed dry out. If you have space, make habitat for beneficial insects, birds and animals too! Start building now to put your solitary bee home up in March or early April! If you already have one, clean it, and if you have an owl house, now is the time to clean it out too. Depending on where you live they are usually empty from Halloween until early December! Nesting site selection starts in January, so build yours and get it up as soon as you can! Santa Barbara’s Seed Swap is January 27! The last Saturday of January every year is National Seed Swap Day! Look in your area for an event, and if you don’t find one, collaborate with your local garden club or permaculture group to get one going! Rainy Day Tips for Spectacular Veggies! Please enjoy these October images at two of Santa Barbara’s community gardens, Pilgrim Terrace and Rancheria! Check out the entire November Newsletter! NOVEMBER ~ More Brassicas, Peas, Chard, Lettuces! Upcoming Gardener Events! Not to miss the January Santa Barbara Seed Swap! International Permaculture Conference, IPC 2020 Argentina!